Filice, Michelle. "Treaty 5". The Canadian Encyclopedia, 01 February 2018, Historica Canada. https://www.thecanadianencyclopedia.ca/en/article/treaty-5. Accessed 22 April 2019. Treaty 5 — also known as the Winnipeg Treaty — was signed in 1875–76 by the federal government, Ojibwa peoples and the Swampy Cree of Lake Winnipeg. Treaty 5 covers much of present-day central and northern Manitoba, as well as portions of Saskatchewan and Ontario. The terms of Treaty 5 have had ongoing legal and socioeconomic impacts on Indigenous communities (see Numbered Treaties; Indigenous Peoples: Treaties). In the mid-1870s, the Indigenous peoples of the Lake Winnipeg area were interested in making a treaty with the Government of Canada. They had heard about the concessions offered to the Indigenous nations of Treaties 1 to 4 (see Numbered Treaties), and subsequently demanded the government provide similar economic assistance, provisions of tools and protection against the encroachment of outsiders (such as surveyors and settlers) on their territories. The people of the Norway House (located about 30 km north of Lake Winnipeg) were also suffering from starvation, as the lands there were not suitable for farming. This community was looking to relocate from north of the lake to an area in the south that had more suitable agricultural lands. While the government was interested in opening up the Lake Winnipeg region for future development, it was not initially keen on negotiating a new treaty. Treaties 1 to 4 had already secured title to the agricultural belt in the West. Minister of the Interior David Laird suggested that, if interested, the Berens River bands living along the eastern part of the lake could be added to Treaty 1. Lieutenant Governor of Manitoba and the North-West Territories, Alexander Morris, argued against Laird’s point, maintaining that if the government acquired the land around Lake Winnipeg from the Indigenous people living there, they could then settle it, use it for resource extraction and develop a valuable travel and transportation route to the West. Morris suggested that the government negotiate a new treaty that ensured the cession of Indigenous land title in this area (see Indigenous Territory). The government eventually agreed to enter treaty talks with the Berens River bands and other communities around the lake. However, it was not yet willing to negotiate a treaty with Indigenous bands north of the lake, even though they too had expressed a desire to enter into a treaty with the Crown. The land in the north had limited agricultural and settlement potential, and was therefore not a priority for the government. However, one exception was made for the Norway House band. Their relocation proposal was met with government approval, and it was agreed that the Crown would include the people of the Norway House in treaty negotiations. 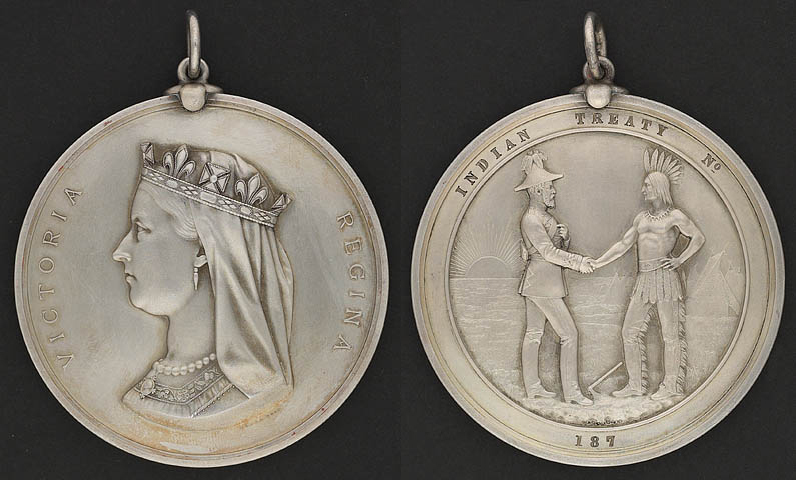 Both sides of a commemorative coin, Indian Chiefs Medal, presented to commemorate Treaty Numbers 3, 4, 5, 6 and 7. In 1875, the government appointed Morris and James McKay, an Executive Council of Manitoba member, to negotiate a treaty with bands around Lake Winnipeg. Since the lands surrounding Lake Winnipeg were not considered as valuable as the plains, the commissioners would not offer the same treaty terms promised to the signatories of Treaties 3 and 4. For example, the peoples of Treaty 5 were to receive a one-time payment of $5 upon signing the treaty, instead of the $12 given to the peoples of Treaties 3 and 4. In addition, Treaty 5 peoples would only receive 160 acres of land per family, which is one-quarter of the land granted to the peoples of Treaties 3 and 4 (although it is the same amount offered to the peoples of Treaties 1 and 2). The rest of the terms and conditions of Treaty 5 were similar to the previously negotiated Numbered Treaties. As a result, there was little room for negotiation on the part of the Indigenous peoples. Under the terms of the treaty, the Indigenous peoples surrendered title to their land in exchange for reserve lands, on which they could hunt, trap and fish. The government retained the right to use these lands for development and/or public works, providing they compensate the Indigenous signatories. The government also promised to maintain schools on reserves, control liquor traffic on reserves and distribute the following annual payments: $5 per person, $15 per headman (band leader) and $25 per chief. Additional gifts, including flags, tools, clothing and medals, as well as monies for ammunition and twine were also provided. Commissioners Alexander Morris and James McKay met with Berens River bands on 20 September at the Wesleyan Mission School House near the trading post along the river. There, they secured acceptance of the treaty terms with little debate, except for some quickly resolved issues about the elections of the chiefs and the selection of the reserve sites. The commissioners would find that these two issues often resurfaced in subsequent treaty discussions that year and next. The following day, the two commissioners moved north to Norway House by way of the Nelson River. On 24 September, they met with two groups of Cree: Christian converts and non-Christians, called the Wood band. After some discussion and translation of the treaty terms, the treaty was signed. Morris and McKay informed the population that a reserve would be established for those who still wanted to move south to farm at Fisher River. While many Christian Norway House band members opted to relocate to Fisher River, the Wood band chose to stay behind at their home in Cross Lake, where it was decided that a reserve would be established. Morris and McKay then went to the Grand Rapids on the Saskatchewan River. They met with the Indigenous peoples of the area on 27 September, and explained to them the treaty terms and reserve selection process. Since this area was to be the site of a proposed transportation development, the commissioners informed the Indigenous peoples that if they ceded their land and moved to the south side of the river they would receive a reserve there. Before they signed an adhesion to the treaty, the band demanded $500 to cover the cost of moving and rebuilding. The commissioners accepted this request, promising to distribute these funds next year. During their travels south along Lake Winnipeg the following day, Morris and McKay encountered Thickfoot, a spokesperson of the Jack Head Point people, along with the Indigenous peoples of Big Island, Black Island, Wapang and other islands in the area. They told the commissioners that they had heard about their treaty visits along Lake Winnipeg and wanted to be included in negotiations. They also requested a land parcel along on the main shore, where they could farm and fish. The commissioners suggested Fisher River, to which they agreed. At that point, they were included in the treaty and told to meet with the commissioners at Dog Head Point next summer to select a reserve. Before heading back to Winnipeg, the commissioners altered the western boundaries of the treaty, so as to include the Swampy Cree at The Pas settlement on the Saskatchewan River. The surrender of land title in this area was considered important for future developments. The commissioners recommended that such negotiations take place the following summer. Despite their progress, the work of the commissioners was not complete. 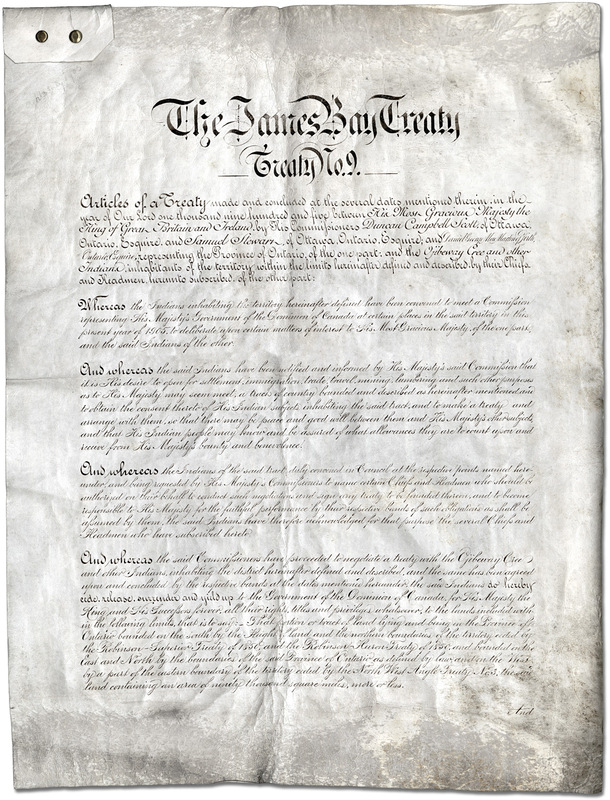 Many bands still had to sign the treaty and select reserves. To undertake these tasks, in 1876 Morris appointed politician Thomas Howard and Dominion Land Surveyor John Lestock Reid. In the summer of 1876, Howard and Reid visited the Lake Winnipeg bands that had yet to sign the treaty. On 24 July, they met with bands from the Bloodvein River, Big Island, Sandy Bar and St. Peter’s band, as well as the Jack Fish Head band of Thickfoot at Dog Head Point. Treaty discussions got off to a rocky start when the various bands demanded that they be negotiated with separately. The commissioners refused to do so, telling them that they needed to choose only one chief and some councillors to represent them. After some discussion, the commissioners added that these representatives were to be the choice of the majority, selected by a ballot vote. Disagreements and tension arose between the bands over these new, non-traditional ways of selecting leaders — a process that the commissioners had been imposing on them for over a year. In 1875, when Thickfoot assumed the role of chief after his discussions with Morris in that year, his own people threatened violence. This self-appointment was something his people refused to acknowledge. In a similar case, a man named Ka-tuk-e-pin-ais did not have the approval of all his community, and yet still signed the treaty on their behalf. Although the treaty was signed by representatives of these bands on 26 July, disputes over leadership indicate that some of the Indigenous peoples were not adequately represented in the treaty talks. On 4 August, Howard and Reid moved on to the Berens River, where they met with the people who did not sign the treaty the year before. After explaining the terms to them, the treaty was signed. At this point, Howard and Reid separated and travelled to different Indigenous communities around the lake. Howard travelled to the mouth of the Saskatchewan River, where he was instructed to pay the $500 relocation fee, distribute annual payments, and deliver tools and farming implements, as promised in the terms of the treaty. To Howard’s surprise, the chief of the Grand Rapids band put forward a number of new demands, as he was under the impression that treaty negotiations were still ongoing. With the help of his translator, Reverend Henry Cochrane, Howard explained that the treaty had already been made last year. Although the chief and his peoples eventually agreed to the terms, they maintained they had been misled. Howard then moved up the river to make a treaty with The Pas band, on the south bank of the Saskatchewan River. After they had chosen band representatives, the treaty was signed. Some Indigenous peoples from Moose Lake and Cumberland House were also present at the signing and were included in the treaty. In the meantime, Reid travelled from the Berens River to Norway House, to arrange for the band’s move to Fisher River. While he was there, he was met by a chief and four councillors from Oxford House, a Cree community in northern Manitoba (now Bunibonibee Cree Nation), who also wanted to be included in the treaty. They requested a reserve on Lake Winnipeg where they could farm. Reid informed them that while he did not have the power to include them in the treaty, he would let the government know about their interest. 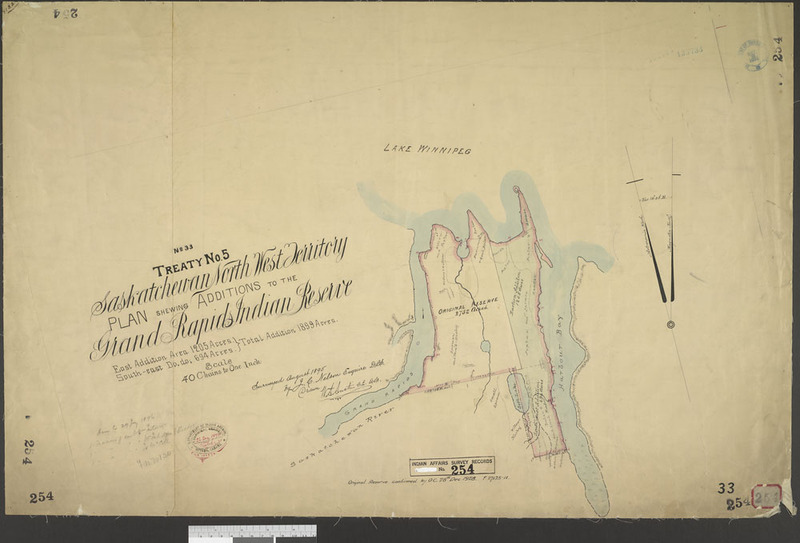 At the end of the treaty negotiations in 1876, the commissioners acquired the signatures of most of the bands living within the original boundaries of Treaty 5, as well as the peoples at The Pas. Treaty 5, Saskatchewan, North-West Territory. Plan showing additions to the Grand Rapids reserve. Deliberately excluded from the first phase of treaty negotiations, the Indigenous peoples of present-day northern Manitoba found that, by the turn of the century, the federal government was now willing to include them in a treaty. In 1905, the government wanted to acquire the land surrenders of peoples living in the new province of Saskatchewan. Railway development, and the discovery of oil in the Mackenzie River Valley in 1920, also made negotiating a treaty with northern Indigenous groups a priority. Originally, the government decided that the Cree bands living at Nelson House and Split Lake would adhere to Treaty 10. On second thought, government officials realized that Treaty 10 provided larger payments and reserves than earlier Numbered Treaties. It was therefore decided that acquiring the adhesion of these bands to Treaty 5 would be more beneficial for the government. In 1907, Reverend John Semmens, an Indian Agencies inspector, was sent to meet with the peoples of Nelson House and Split Lake to discuss their adhesion. These bands signed the treaty, hoping that it would mean a better future for their communities. In 1908, Semmens continued to the mostly Cree communities at Norway House, Cross Lake and Fisher River, where he added the names of approximately 350 Indigenous peoples. In 1909, Semmens travelled to the mainly Cree First Nations of Oxford House, God’s Lake and Island Lake. The Indigenous representatives from these communities signed the treaty. Finally, in 1910, Semmens added the Oji-Cree of Deer Lake East and the Indigenous peoples of Fort Churchill and York Factory to Treaty 5. Semmens’ treaty trip in 1910 marked the final formal stage of adhesions to Treaty 5. 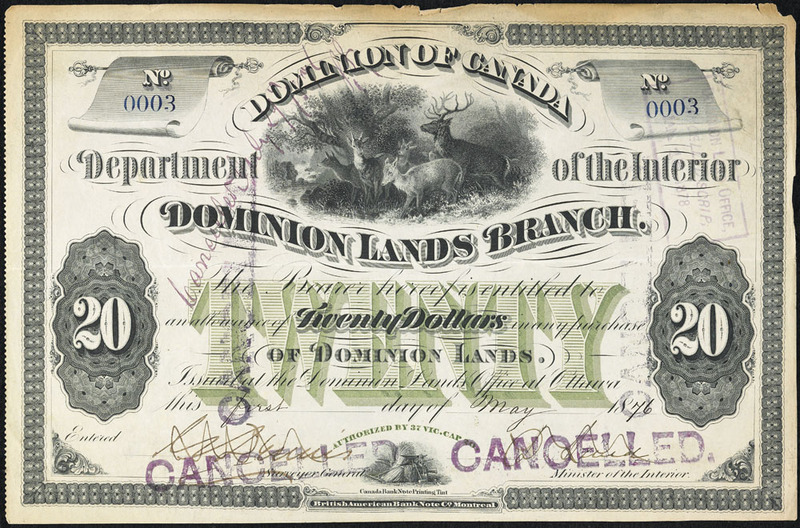 Métis scrip issued for the purchase of dominion lands, 15 September 1905. From 1908 to 1910, Reverend John Semmens accepted applications for Métis scrip in northern Manitoba (see Indigenous Peoples: Treaties). Scrip was a certificate, awarded by the federal government to individual Métis people that “extinguished” (surrendered) Aboriginal title in exchange for land or one-time cash payments. Through applications for scrip, some Métis people surrendered their claims to territories north of the 1875 treaty boundaries in Manitoba during the Treaty 5 (and Treaty 10) adhesions. Today, many Métis argue that scrip had negative, long-term effects on their community. Unlike treaties, scrip claims were not negotiated, nor did they provide for annual payments, land bases, provisions of food and tools, and/or long-term economic assistance. Many Métis peoples also lost benefits as Status Indians through scrip settlements (see Indian). Misunderstandings about the treaty terms, especially concerning the selection and location of reserves, complicated the administration of the treaty early on. When the assignment of reserves began in 1877, the Indigenous signatories of Treaty 5 recognized that the reserve boundaries did not accurately reflect band divisions. Some groups, such as the Moose Lake band, requested smaller reserves that better reflected their local community and leadership. Other bands requested additions to their reserves or new parcels of land altogether. For example, in 1901, the Norway House band appealed for more land conducive to farming. By the turn of the century, many Treaty 5 bands had secured revisions or improvements to the boundaries of their reserves. The Indigenous signatories of Treaty 5 also cited other problems with treaty administration, including: the failure of the government to provide seed, cattle and farming tools; errors in band membership lists; and problems with reserve schools. In the early 1900s, William McLean, a Department of Indian Affairs agent, raised doubts about whether the Indigenous peoples truly understood the treaty terms. The Split Lake and Nelson House bands asked McLean questions about hunting and fishing rights that suggested they did not understand the concept of reserves. Elders argue that the Indigenous signatories believed they were sharing, as opposed to ceding, their territories. Some historians have argued that hasty treaty commissioners, eager to open up Indigenous territory to settlement and development projects, failed to clearly communicate the terms of the treaty to the signatories. Their desire to finalize the treaty quickly also prevented the Indigenous peoples from negotiating the treaty terms, which had, in large part, already been set by the commissioners before their trips. Finally, cultural and linguistic differences, as well as foreign systems of leadership forced upon Indigenous communities during treaty discussions, only added to confusion and misunderstandings about the terms. There is no one organization that represents all of the Treaty 5 Indigenous nations. However, Nishnawbe Aski Nation (NAN) represents a portion of this community, including 49 First Nations of Treaty 9 and Treaty 5. NAN aims to protect the Indigenous rights of treaty signatories, work towards self-government, promote Indigenous culture and business, and improve the quality of life and education in Nishnawbe Aski territory. Alexander Morris, The Treaties of Canada with the Indians of Manitoba, the North-West Territories and Kee-watin (1880). Frank Tough, As Their Natural Resources Fail: Native Peoples and the Economic History of Northern Manitoba, 1870–30 (1997). Arthur J. Ray, Jim Miller and Frank Tough, Bounty and Benevolence: A History of Saskatchewan Treaties (2000). Donald L. Fixico, Treaties with American Indians: An Encyclopedia of Rights, Conflicts and Sovereignty (2007). Michael Asch, Aboriginal and Treaty Rights in Canada (2011) and On Being Here to Stay: Treaties and Aboriginal Rights in Canada (2014).